In a previous article I wrote about the importance of seeking feedback from clients, and the ways in which to go about obtaining it. But don’t forget what may be the most important part of the equation – what to do with the feedback once it is received. Obtaining feedback from clients and never looking at it or taking action on it can be worse than failing to ask for the feedback in the first place. The response to the feedback you receive doesn’t necessarily have to be a direct response to the client, although in many cases, a direct response is appropriate. A client who takes the time to provide constructive suggestions for improvement of a firm’s performance is going to expect action from the firm – either a change in the way the firm provides its services, or some explanation or further discussion from the firm about how to deal with the client’s matters in the future. But whatever feedback the firm receives should be acted upon in some way. And the feedback should always be shared in some manner with those that worked on that client’s matter, including support staff and associates. Although it may not be appropriate in all cases to share the exact response received, the nature of the response should be communicated if the firm expects to improve on weak performances and to encourage strong performances. Many lawyers make the mistake of taking action only on negative client feedback, but results of a client survey or study indicating that the firm’s performance is ‘ok,’ may warrant more of a response from the firm, whether internally or directly to the client, than purely negative feedback. It is the merely ‘ok’ response that may signal danger for the firm for the simple reason that those results are easy to overlook. It is the indifferent client that the firm has the best chance of turning into a satisfied and enthusiastic future client if the client’s concerns are acknowledged, particularly if there are areas in which the firm can improve its performance in the future for that client. Although negative responses do warrant attention, there are some clients who just won’t be satisfied, and these may be the clients that the firm does not want to encourage to return. By contrast, the indifferent client can often be won over. Rather than ignoring the ‘ok’ response, the firm should seek to identify the areas in which the client was less than thrilled with the firm’s performance. Often, the areas of disappointment or indifference relate not to the firm’s technical expertise, but to the level of service provided to the client – the ‘experience’ that client had with the firm. If the firm has received the client’s feedback in written format, sometimes a follow up meeting between the client and senior members of the firm can go a long way toward repairing or strengthening the client relationship. Remembering that the law is all about relationships, it is the service, rather than the techinical expertise, that often ‘makes or breaks’ the attorney-client relationship. Most client complaints are experience or service-oriented, rather than results or expertise-oriented – the lawyer failed to return telephone calls, the lawyer didn’t listen, the lawyer was condescending to the client, the lawyer failed to keep the client informed of progress on the matter, the lawyer failed to provide the client with a reasonable overview of the matter in terms of time, procedures, and billing expectations, the lawyer failed to live up to promises about deadlines or timeframe, the lawyer failed to alert the client to major changes or complications with the engagement, the staff at the attorneys’ office failed to make the client feel welcome or understood, etc. The good news is that these issues are often easily dealt with, once the firm is aware of them. But failing to follow up with a client that provides an ‘ok’ report robs the firm of the ability to learn of these issues, which many clients will not raise on their own unless and until the problem is beyond the point of repair. Finally, don’t ignore positive feedback from a client. If you or your firm receives a glowing review from a client, ALWAYS, at the very least, say thank you. You can thank the client in a letter, via email or with a follow up telephone call. Let the client know you appreciate their taking the time to complete your survey and thank them for their positive comments. You may also want to ask the client’s permission to use them as a reference, or to use their comments as a testimonial for your firm. Some clients may be uncomfortable with this idea, so this conversation needs to be extremely respectful of the client’s wishes. (See my earlier post about client testimonials here). However, there are many clients who are more than happy to be a ‘raving fan’ for an attorney that has provided outstanding service. Seeking feedback from clients is important. But what is the most effective way to obtain this information? The answer may depend on the kind of practice you have and the nature of the particular client – whether it’s an ongoing relationship or a ‘one time’ client. So many lawyers boast in their marketing materials, on their websites, in firm brochures, etc., that they provide ‘excellent client service.’ Ultimately, in order to back up those claims, law firms need to connect with their clients in meaningful ways – by staying in touch, by showing interest, by learning about the client’s business, by anticipating clients’ needs, by providing solutions that make sense from the client’s point of view, and by checking back with clients to see whether they feel that we’re doing enough. Sometimes the best way to serve our clients is to admit what we don’t know and set about learning it – whether directly from them, or from other sources. Client feedback can be sought through completion of client surveys or feedback forms sent to a client upon completion of each matter. The advantage to this type of system is that many clients will be more forthcoming on paper than they would be when speaking directly to a lawyer from the firm, particularly if the lawyer is one with whom the client works on a regular basis. The disadvantages of using forms is that many clients will not bother to complete the forms, particularly where the concluded matter is a ‘one time only’ engagement. One possible solution to this dilemma is to provide the client with an opportunity to provide feedback to the firm earlier in the process, thus allowing the firm an opportunity to learn whether the client is happy with their experience of the firm and to correct any misunderstandings while the matter is ongoing. Written feedback forms should not be too long or too cumbersome to complete, lest they discourage the client from responding. A few ‘narrative’ questions may be helpful, however, for written format feedback, ratings-type questions (for example 1-5) may be easier and faster for a client to complete. David Maister, in his book Managing the Professional Services Firm, contends that client surveys with 25 or so ratings-type questions are simple for clients to complete and have historically been shown to communicate the firm’s desire to improve while allowing the client to provide both positive and negative feedback. Maister contends that response rates to questionnaires of this kind are high where the client is aware that the questionnaire is coming, and where the questionnaire is returned to the firm, rather than to the specific partner with whom the client deals on a regular basis. Another way to obtain client feedback is to schedule an interview with the client at the completion of the matter. If possible, this interview should be conducted by a senior lawyer in the firm, although not necessarily the lawyer that regularly handles this client’s matters – once again encouraging candor. Some narrative questions can be included as well. Ask what suggestions the client has to make the client’s experience more enjoyable or improve the firm’s service, what would encourage the client to hire your firm in the future (or recommend the firm to a friend or colleague), what areas the client thinks the firm could improve and in what areas the client thinks the firm excels. Many clients appreciate the opportunity to praise particular individuals within the firm (including the non-lawyer staff) with whom the client has dealt, particularly on long-term engagements. Some firms may want to include an opportunity for the client to identify the individuals with whom the client interacted by name and to provide specific comments about the service they received from those individuals. Fellow lawyer Arnie Herz of Legal Sanity believes that one of the reasons for lawyer discontent is the failure to address what “sparks us and supports our curiosity, interests and desires.” I agree wholeheartedly that lawyers, as people, need to get in touch with what inspires them and moves them to action. It’s why I’m a big proponent of lawyers and law firms creating vision and mission statements. We all do our best work when we’re inspired – when we’ve tapped into our passions. Overlooking our desires and passions is a huge loss, both for ourselves and for our clients. Arnie’s post laments the view that “there’s little to no self in healthy business relationships; it’s all about the consumers we serve and what we can do to help them thrive.” I do agree with Arnie that, “Business relationships are as much about valuing and evincing our selves as they are about reaching and helping others.” The starting point must be the self. It all begins with what motivates us and gets us excited about working. But in order to be successful as business people, it’s necessary to translate our passion into something that helps others. Where I disagree with Arnie is his discussion of the elevator pitch. Arnie takes issue with the notion that the elevator pitch needs to be about the client, rather than about you and what you care about. Your business, in order to be enjoyable as well as successful and sustainable, needs to honor the self and be an expression of the self. But your marketing materials – the way you convey your self to others, including your elevator pitch, must be geared toward your clients. The ‘self’ – whether that’s the firm or the individual lawyer – determines what kinds of clients to target, the markets within which to compete, the kinds of services to provide, and the manner in which you’re going to provide them. However, once you’ve identified those items, and aligned them with your self and your passion, you’ve got to get the clients in the door. In order to get the clients to walk in the door, the marketing needs to focus first on the client – on their needs and how you can solve their problems. Unfortunately, many lawyers forget this when crafting their marketing message – they focus too much on their credentials, their skills, and on the things they deem to be important, rather than focusing on the client’s problems and the client’s needs. To get the clients, you’ve got to get them interested in what you’re offering. You’ve got to get them to see themselves in your message. The bottom line: align your practice with your passions, desires, interest and curiosity. But then craft your message in such a way that it addresses the client first. A friend recently asked me, “How many cases should I take in a year?” Unfortunately, there’s no magic number to answer that question, perhaps that’s because it isn’t the right question to ask – it’s looking at the problem from the wrong end. A better way of getting to the information that I think my friend really wants to know is by starting from the outcome that you want to achieve. This will be different for every practice. What matters really isn’t the number of clients, per se, but whether you’re accomplishing what you want and need to with your practice. “Too many” clients may just mean that it’s time to expand your practice and bring on some help, or start taking on higher value, but lower volume work. “Too few” clients may mean that you aren’t charging appropriately for your services or you aren’t effectively marketing yourself. Instead of looking at the problem from the angle of “how many clients should I take on this year,” which, translated, really means, “how many clients do I need to take to get where I want to be financially and to satisfy my other needs related to the practice, i.e. professional fulfillment, etc.,” try looking at it from the opposite perspective and define what those needs are, and then you can work backwards to determine the best way to get there. Looking at your practice from this angle is similar to looking at the vision you have for your practice (you can read more about that here.) Once you have the vision, you can determine the steps you need to take to get there. Once you know what you’re looking for from your practice in the next year, you can determine what kinds of cases you need to take, how many to take, and how much you need to charge to reach your goals. What kind of practice do you have? How many current cases are you handling? How much time, on average, does it take for you to handle each case? Are the kinds of cases you’re handling now the kinds of cases you want to handle, or are you looking for something different? Are your cases ‘high value/low volume’ cases, or ‘high volume/low value’ cases? Can you delegate some of the ‘lower value’ or administrative work you do to another person, whether it’s another lawyer or an assistant? Do you practice in multiple areas of the law, or just one? What are your expenses, including retirement, medical and dental expenses, among others? How do you charge your clients – flat fee, hourly, contingency? What fees do you currently charge? How much do you want or expect to make this year? Do you plan to take some cases on a ‘pro bono’ or ‘low fee’ basis? How many hours of your day can you reasonably expect to bill? What is the going rate for legal services in your practice and geographical area? The bottom line for me is to figure out what you want your year to look like, and then determine how many, and what kinds of cases you want or need to take. By under-promising and over-delivering, law firms can increase their bottom line and improve the reputation of lawyers in general, and that makes exceeding clients’ expectations just good business. Of course, there is an opposing viewpoint. Exceeding clients’ expectations is considered by some to be a “stupid strategy.” However, often, those that think exceeding expectations is the wrong path to take often base their opinion on the premise that exceeding clients’ expectations offers more value to a customer than the customer wants, and cuts down on profitability. But under-promising and over-delivering doesn’t mean providing additional value to the client in such a way that it hurts the firm’s profits. On the contrary, it creates increased profits by increasing client loyalty. Often, exceeding clients’ expectations does not require additional expenditures of money or time, and can be accomplished simply and effectively. Seemingly small changes can make a big impact. Some good examples include communicating with clients on a timely basis, ensuring that each contact the client has with the firm is pleasant and courteous, and making clients feel as if the firm cares about the client and her business. Some define good client service as determining the client’s wants, and then delivering exactly that and nothing more. In my opinion, this is not only short-sighted, but is a disservice to clients. 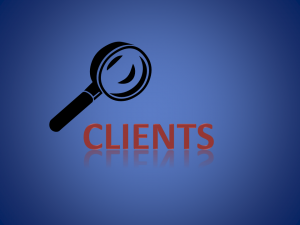 Clients hire lawyers for their expertise, advice and experience. Sometimes what the client ‘thinks’ they want is, upon further reflection or exploration, not in the client’s best interests. Often, the lawyer is able to suggest different alternatives that would better meet the client’s needs, or more effectively accomplish the client’s goals. Creativity and innovation in the approach to a client’s problems may be the best value a firm delivers. A mindset that places a premium on the client’s stated wants and disregards the firm’s ability to assess the situation and suggest alternatives, is a huge loss for clients and de-values the importance of hiring an attorney. It’s this kind of thinking that leads people to the conclusion that legal services are a mere commodity. In short, exceeding clients’ expectations is an excellent strategy. It is the essence of good service. Can Excellent Client Service Be Taught? A brief article in the July 2006 Inc. magazine caught my eye. The piece was about customer service in restaurants, but the lesson applies to law firms, too. A reader asked whether great customer service can be taught. The answer, by Danny Meyer, CEO of the Union Square Hospitality Group, a company which includes the Gramercy Tavern among its holdings, makes a distinction between customer service and hospitality, and claims that the latter cannot be taught. 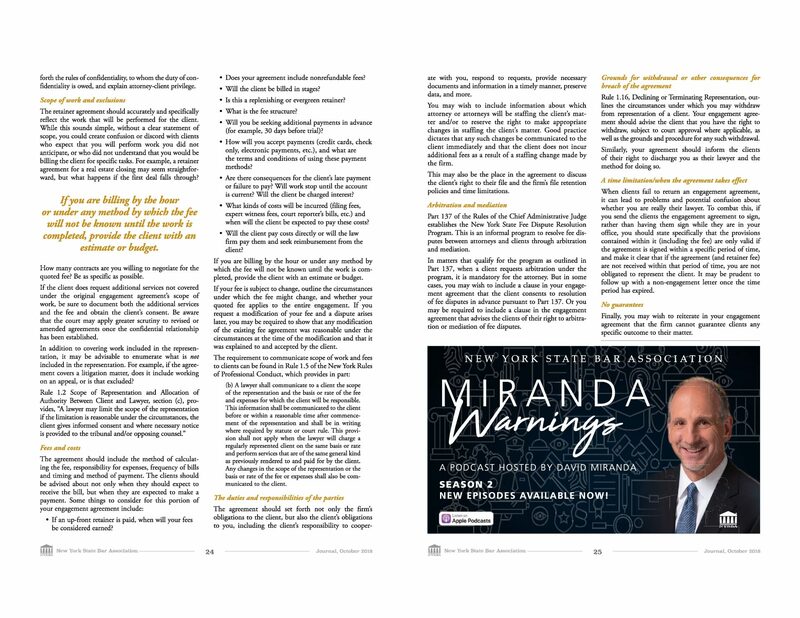 Meyer says that in the restaurant business, customer service is, “getting the right food to the right person at the right time.” In the legal world, that translates to performing the work competently and on time for the client. In short, it’s what I call technical skill. Hospitality, on the other hand, is defined by Meyer as, “the degree to which your customers feel that your staff is on their side.” To Meyer, this includes such intangibles as remembering repeat customers, listening, making eye contact, and handling mistakes well. When I talk about providing excellent client service, I’m talking about what Meyer calls hospitality. That’s the real essence of client experience. It’s what will make the difference between a good law firm and a great law firm. In the legal world, there’s nothing the client wants more than to feel that his lawyer, and indeed the entire firm, is on his side. The ‘hospitality mentality’ needs to be present throughout your firm in order to provide your clients with a good client experience. Your receptionist should take care to remember long-standing and repeat clients. Professional staff must be mindful of listening to the client’s needs and concerns, rather than merely barging in with the lawyer’s solution to what the lawyer perceives the client’s problem to be. Clients must be treated courteously and professionally at all times. They should always be made to feel that everyone in the firm, regardless of position and familiarity with that particular client, is there to serve the client – as indeed they are. For a truly spectacular client experience, everyone within the firm must be willing to ‘go the extra mile’ for a client, and to do the unexpected. Sound easy? It may be, but time and time again I’ve observed law firm personnel, whether staff or attorneys, ignore clients sitting in the waiting room, brush off a client’ s call without attempting to help because they aren’t familiar with the client’s problem or because the person whose ‘job’ it is isn’t currently available. 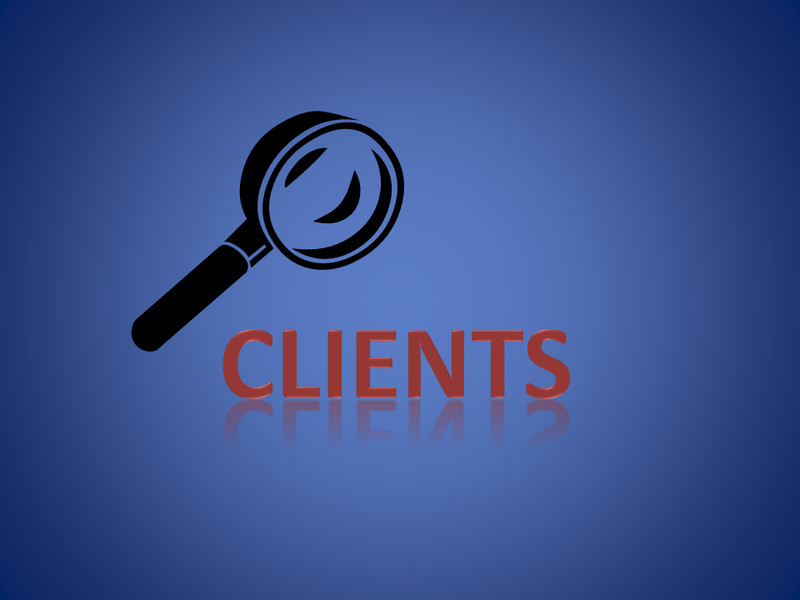 Client service is the job of every individual employed by the law firm. For employees who aren’t providing the proper level of hospitality, Meyer recommends telling the employee precisely where he’s going wrong and giving him a fixed amount of time to make specified improvements. For law firms, that means feedback of a less than traditional nature. And that feedback can’t wait until an annual performance review – your relationships with your clients are too important for that. 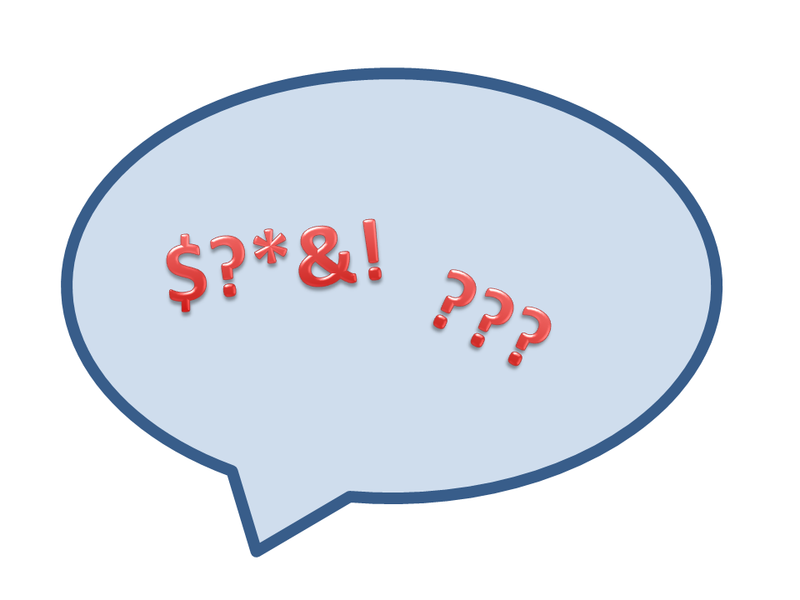 Feedback needn’t be formal, but it must be provided at all levels on an ongoing basis. This feedback should be made in conjunction with client review sessions or client satisfaction programs. Hospitality, or an outstanding client experience, is often a product of the firm’s culture and environment as a whole. As Meyer cautions, “hospitality starts with employees treating one another with respect and trust. If that’s missing with your staff, it will be missing with guests.” Wondering whether your clients are being treated the way you want them to be? Look first at how your partners, associates and staff treat one another – if your internal culture, atmosphere and communication are poor, chances are the client experience with your firm may not be as positive as you’d like it to be. Meyer contends that the key to hospitality is hiring the right people, because hospitality cannot be taught. Although I don’t necessarily agree completely, I do agree that a firm can’t provide its clients with a truly great client experience without the right people. Meyer says he looks for five key traits when interviewing prospective candidates to work in his business: friendliness, curiosity, a good work ethic, empathy and self awareness. What do you think are the key traits a legal employer seeking to increase the quality of client experience with her firm should look for? For more about how your firm can incorporate client service into its cultures, see these articles and blog posts: Considering Client Service as Part of Employment Reviews, Exceeding Clients’ Expectations, How Client Dissatisfaction Can Hurt You, Do You Know What Your Clients Really Want? and Rules for Client Service. If you’d like to read more about client feedback programs, you can check out these articles and blog posts: Do You Know if Your Clients are Satisfied?, Tips For Obtaining Client Feedback, What to do With Client Feedback and More on Client Surveys and Client Satisfaction. In ongoing surveys of lawyers that I’ve conducted, most agree that client service is an important part of marketing, and yet many don’t have methods in place to measure client satisfaction. Among those that do have such procedures in place, even fewer follow up with clients after each individual engagement to determine their satisfaction. Many lawyers tell me they don’t need formal procedures to gauge client satisfaction – they just ‘know’ whether or not their clients are satisfied. But do they really know? Don’t make the mistake of assuming that clients who don’t complain are satisfied clients. Once a client starts making objections, it may be too late to salvage the relationship. Many clients don’t complain until they’re already fed up and ready to walk out the door – or at the very least, not recommend you to others. Some lawyers are afraid to ask clients for feedback because they fear it will invite clients to think of negative things to say. But the point of seeking information from clients is to find out how to improve your service. Sometimes even ‘over the top’ clients have legitimate complaints or concerns that can be addressed in a more global way. And often even the most unreasonable client complaints have a nugget of truth at heart that is worth exploring. 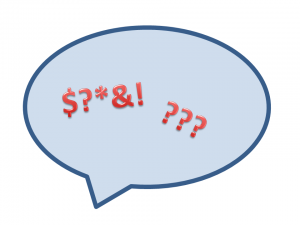 Another objection I’ve heard to seeking client feedback is that once a lawyer asks a client for their feedback, the expectation is that their complaints or concerns will automatically be addressed or resolved. Many lawyers fear that clients will suggest changes that the lawyer cannot make for ethical, financial or other reasons, and that failing to make those changes paints the lawyer in a worse light than failing to ask for feedback in the first place. In rare cases, that may be true, but turning that objection on its head may lead to a valuable learning experience. If the client making the objection is a repeat client, or one from whom you are likely to get business in the future, the issue might be worth exploring in a more in-depth conversation or face to face interview to determine whether there is some middle ground that can be reached. Keeping an open mind during these conversations may lead to solutions the lawyer never considered – solutions that could be beneficial to both sides. Alternatively, speaking with the client about the issue and addressing their concerns while explaining the reasons why changes can’t be made in the way they anticipate can strengthen your relationship and may provide the client with a better understanding of the way in which you work, while at the same time providing the attorney with valuable insights into the client’s priorities and goals. Even for ‘one time’ clients, addressing these kinds of concerns can be valuable. Perhaps the issue is one that needs to be explained in more detail at the time you are retained to avoid misunderstandings with future clients. And chances are that taking the time to talk with a client, even one for whom you’ve already concluded your business, will generate goodwill that may lead to referrals in the future. Seeking out feedback from clients can help you determine what kinds of clients to take on in the future; perhaps hearing the same complaints from the same kinds of clients is a signal that this type of work, or clients that fall into this particular category, are no longer the type of clients with whom you enjoy working, or with whom you can profitably run your practice. 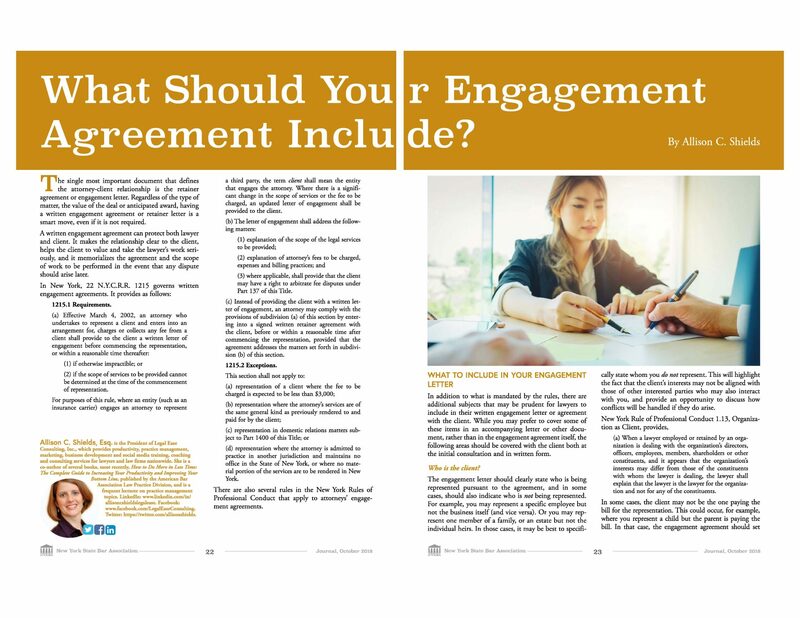 Following up with clients after an engagement is concluded can also lead to valuable positive feedback about individual lawyers in the firm or about specific areas in which the firm excels. Sometimes the firm may not even be aware that they have particular strengths (or may not be aware that clients take note of them). In these cases, client feedback can provide valuable insight into the firm’s competitive advantages that can be used to differentiate the firm from the competition and strengthen its marketing. Clients that see that their attorneys show a genuine interest in the client’s experience are often that much more willing to help the lawyer by referring the firm to friends and colleagues. And great comments on a client feedback form or in a follow up interview with a client after the successful conclusion of a case can sometimes lead to references or testimonials. Whether we agree with Godin or not, it behooves us to realize that consumers, which includes consumers of legal services, often don’t articulate what it is that they really want. Sometimes they don’t know what they really want – at least initially. It takes a little digging, a little conversation, a little interaction with them to get to the heart of what they really do want. And sometimes it takes a little testing. Clients often act very differently than they think they will or say they will at the outset if some basics are not explored. I had a very interesting conversation with an attorney last week after one of my presentations. We were discussing how he talks to clients about fees and expectations. Although clients often tell him that they only want him to do work on the file, when he probes a little deeper with them, he often finds that what they really want is for him to use his discretion to determine what would be best for the client, both economically and in handling the file. For example, when he points out to the client that they’ll be paying his fee to appear for non-substantive conferences that require an appearance but have already been adjourned ‘on consent’ of the parties, the client agrees that perhaps he doesn’t want the partner to do everything on the file, and that the partner should use his discretion to determine when to send an associate. This lawyer is very smart. He’s created a win-win situation. He wins and the client wins. The client is getting great representation in the most economical manner it can be delivered. The attorney is still accountable to the client, but he’s leveraging properly so that he can focus on the tasks that need to be handled by a higher level attorney, while giving his younger associates experience and keeping the client happy. If done properly, not only does it keep the client’s costs down, but ultimately, it maximizes the return for the firm as well. And his conversation with the client enhances the relationship of trust. The client knows that, rather than trying to ‘milk’ the client by getting his partner rate for everything from photocopying to filing papers and doing routine tasks on the file, the attorney is making informed, professional decisions about the appropriate staffing for the project. It may sound simple, but there are lots of firms out there that wouldn’t challenge the client when the client says they only want the partner handling the file; they’d just charge the client for everything at the partner’s rate, thinking they’re getting a windfall. But ultimately, that doesn’t enhance the relationship with the client if that wasn’t what the client really wanted – regardless of what the client said in the beginning. And it’s poor use of the partner’s time as well. It’s our responsibility as lawyers to educate clients about what they can and should expect from the process. If your clients are insisting on an immediate, ‘perfect’ result at very little cost, consider exploring whether that’s what they really want, and whether that’s a reasonable expectation. Others may disagree, but I think that it’s the attorney’s responsibility to turn away clients with whom he or she cannot agree on reasonable expectations. Allowing a client to proceed under false expectations spells disaster, usually for both the attorney and the client. Taking the time to talk to clients about realistic expectations and interacting with them, addressing their real concerns, digging deeper to determine what result they really want and what you can realistically provide is critical to establishing the trust and confidence that are essential to a good attorney-client connection. This probing and process of education creates value and shows the client that you respect them, your work, and the others that work with you.